Top class, professional data destruction! 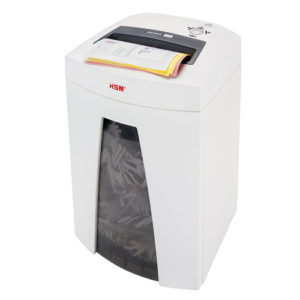 This document shredder impresses with its innovative IntelligentDrive motor and operating concept and incorporates a touch screen display. Perfect for large working groups of up to fifteen people. Top class, professional data destruction! 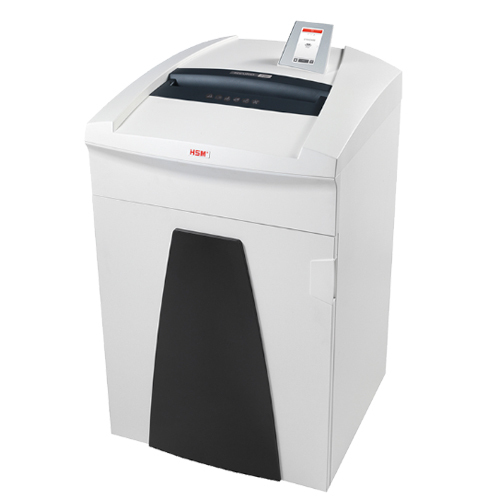 This document shredder impresses with its innovative Intelligent Drive motor and operating concept and incorporates a touch screen display. Perfect for large working groups of up to fifteen people. The high quality materials and proven HSM “Made in Germany” quality guarantee you are receiving a safe and durable machine – and also 3 years warranty. The induction-hardened, solid steel cutting rollers with a lifetime warranty can easily cope with staples and paper clips and guarantee durability. The innovative drive and operating concept IntelligentDrive offers an increase in performance of up to 40 %. One of three operating modes can be selected as required: silent for particularly quiet operation, standard with an optimum throughput rate and low noise level and performance for maximum cutting and throughput performance. Intuitive operation and multi-language menu selection via the high resolution 4,3″ touch display. Relevant information such as operating modes and status reports are displayed. Consumable material, machine and contact details can be called up. Due to the intelligent paper jam prevention feature, the system recognises automatically and quickly whether too much paper has been fed in. The machine goes into reverse or increases the power temporarily and pulls the paper in. The stand-by and automatic switch-off features ensure a high degree of energy saving when the shredder is not in use. The powerful motor ensures a high cutting capacity and reliable continuous operation. 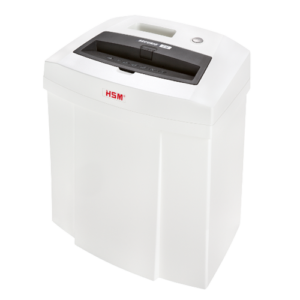 This maintenance friendly document shredder has an integrated automatic oiler which ensures that you have a consistently high cutting capacity. 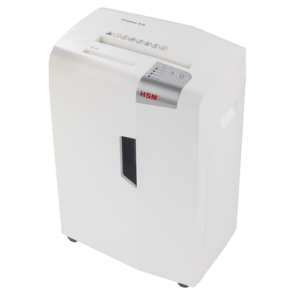 This Cross Cut Shredder is suitable for Departmental and Large Offices.